Paisley has strong links with Scotland’s royal past and its abbey is the resting place of several Stewart Kings. It is best known today for its distinctive Paisley clothing pattern and the town has always been associated with weaving and the textile industry. Here at Hog Roast Paisley, we are best known for our high-quality hog roasts, but thanks to our imaginative and well-rounded menus, and our ability to consistently deliver excellent service in any location, we are rapidly establishing a reputation for being one of the most versatile catering companies in Paisley. Paisley may have a long history, but hog roasting has an even longer one. This archaic cooking technique dates back thousands of years and just as our ancestors did before us, we believe it is the best way of cooking meat, and judging by how popular our hog roasts are, so do our clients. Our cooking method may be ancient, but we use the most modern hog roast cooking equipment available on the market to achieve the most flavoursome and succulent results every time. Hog Roast Paisley’s range of machines are robust enough to be used in rugged outdoor locations and compact enough to be operational in more intimate indoor spaces, as well as being a sociable centrepiece for any occasion. 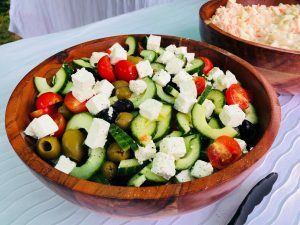 Our Catering Team are all experts in our field and can provide large and small buffets, chic corporate menus and formal 3-course wedding meals in any venue for any amount of people with equally excellent results every time. Regardless of what menu you have chosen or how many people we are cooking for, we always prepare every dish from scratch at your venue in full view of your guests and all of our ingredients are sourced from the finest local food producers in the Paisley area. Because we never pre-prepare anything, we always arrive at your venue several hours before your event is due to take place, to ensure everything is prepared to perfection and served right on time. We are the ideal option for any event in Paisley because of our ability to produce excellent food in any environment and we can guarantee that if you choose Hog Roast Paisley to cater for your special occasion, your guests will be treated to a truly unique dining experience.